It's been 27 days of Los Angeles here on Fashion Foie Gras, and today we're recapping all we've talked about over the month of February. For those who may have missed a few posts, or for others just looking to have a complete guide to Los Angeles all in one place, this post is for you. 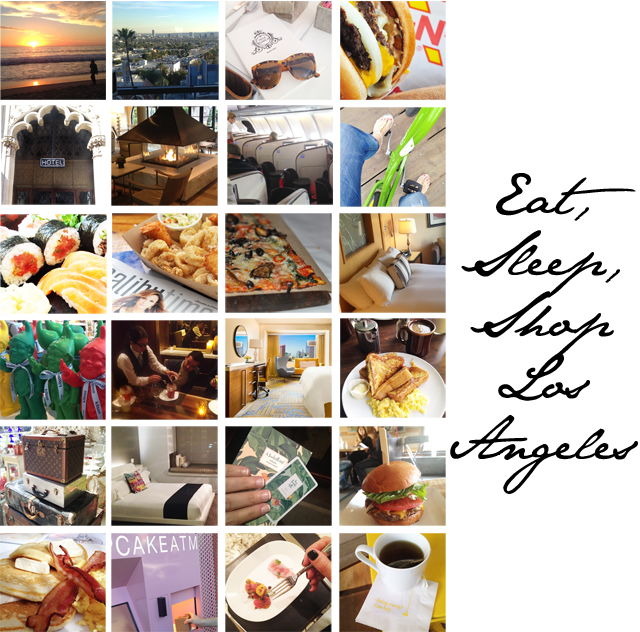 This is a comprehensive look at where to eat, sleep, drink and shop while in Los Angeles. So for those of you scratching your heads and saying, "what should I do when I'm in LA?," there's no reason to scratch any longer. It's all here in black and white, with links to all reviews that also feature information on how to book and where you're headed. So without further ado, here is a complete listing of what to do while in LA, all with the FFG seal of approval. We flew Virgin Atlantic Upper Class to Los Angeles. If you can make this happen, do it. Worth every penny spent for 11 hours of pampering. If you want to live like a rock star, check into the Andaz Hotel on Sunset. So hipster it hurts? There is only one place to stay in Downtown LA - The Ace Hotel. For a real thrill, check into the Beverly Hilton. This is celeb heaven. Just think Golden Globes. Yup, it's held here. Headed to Bel-Air? You need to know of one hotel and one hotel only - the Hotel Bel-Air. Looking for a good night's sleep, actually the best night's sleep ever? Check into the Sofitel LA where the beds are like sleeping on heavenly clouds. Swoon! If you are headed to LA Live for a basketball game, red carpet event or a world premiere, check into JW Marriott LA Live. Great accommodations and more celebs than you can shake a stick at. The W Hotel Hollywood will knock your socks off with great customer service, rock star quality rooms and a Sunday Jazz night to remember. I'll just say this. You can't go to Beverly Hills and not stay at the Beverly Hills Hotel. Looking to live it up in West Hollywood and want the best Brussels Sprouts of your life? Try Cleo at The Redbury on Hollywood and Vine. Think cotton candy is just for county fairs? Think again. Cotton Candy's cool again and served as the most delicious after at Culina in the Four Seasons Los Angeles. Any local will tell you that In-n-Out burger is a rite of passage. Melt in your mouth goodness here any time of day or night. Careful, they should come with an addiction warning. Fan of The Real Housewives of Beverly Hills? You'll want to pop into Villa Blanca just off Rodeo. The food is fantastic and you'll get a little rush seeing cast members pop in and out. Make time to drive up the Pacific Coast Highway and stop into Neptune's Net for great seafood in Malibu. There's a hidden secret in Los Angeles and it's a hole in the wall sushi place called Hide. Great name seeing as it is quite literally hidden in what looks like a strip mall. Go, as you won't regret it. Old school LA can be found at Rae's Diner. You will feel like you've stepped back in time 50 years. This is my favourite place for breakfast in LA. If you're craving a thick, juicy burger in the heart of Santa Monica, make your way down to Pono Burger. The decor will surprise you. On the hunt for Bottomless Bellinis? Grab them at Joe's for brunch on Abbot Kinney. If you have a fear of getting it all wrong when it comes to style in LA, look into working with Style Haus to style your whole LA adventure. If you're looking for some stellar hair products, and also a great blow out (the best in town in fact), step into the Drybar in Los Angeles. There are actually a few locations in town to choose from. Do not visit the Los Angeles area without taking a bike ride from Santa Monica Pier to Venice Beach. It's a must. Don't ask questions, just do it. Take time to watch the sunset in Santa Monica. It's good for your soul. Looking to bring souvenirs home for friends? The best place to shop for gifts in Los Angeles is Kitson. Love antiques or querky pieces for the home? Put Bountiful on Abbot Kinney on your list of places to shop. The owner is a gem and the pieces she possesses are of another world. Also a favourite haunt of celebs. Not sure whether to put this under food or experience, but it's the perfect note to finish on. Visit the Cupcake ATM in Beverly Hills. Open 24 hours, this little machine is a godsend.